Humble chokecherry occupies openings and clearings of forests, edges of fields and pastures all over Europe and America. It is one of the first volunteer trees on logging and fire sites and an important native tree or bush for land restoration and naturalization projects, as it provides food and habitat for numerous species from bears to chipmunks. Sadly, today it is mostly ignored by people. Though chokecherry is a close relative of domesticated cherries, plums, peaches and apricots, the taste of its fresh fruits may be a bit discouraging. It is sharply astringent and leaves a dry sensation in a mouth and throat. However, the most valuable bioactive compounds are bitter, astrigent and acid. Thousands of years of selection removed these compounds from garden fruits and berries, making their phytonutrient content much inferior to that of their wild cousins’. That is why wild chokecherry contains three times more antioxidants than a cherry from an orchard tree. Chokecherry leafs and fruit pits contain poisonous hydrocyanic acid which may be harmful in substantial doses, especially to livestock. Heat, however, neutralizes the poison, and fruits has been widely and safely used for generations for jellies, jams and wines. Native Americans highly cherish the tree and use its bark and dried fruits as a food and as a medicine. They call the period during which the chokecherry is in fruit “black-cherry-moon”. To me, there are two “black cherry moons” in a year. The first comes when chokecherry blooms and its fluffy clusters of tiny white flowers transcend the most heady spring aroma. The second is when it is time to forage the shiny, dark burgundy fruits. I never had problems with chokecherry taste and usually consume a big chunk of my harvest on a way home. I remember how, being a free range kid, I used to climb on a low branches of an old chokecherry tree and spend the whole day there picking and eating fruits, competing with birds, until my mouth became completely numb. Too bad “black cherry moon” didn’t last long. Remarkably, chokecherries make excellent jams and jellies. The taste remotely resembles the taste of sour cherries and all the excessive tartness disappears in the first minutes of cooking. I like to combine chokecherries with foraged wild apples. They add more texture, more complexity to the taste and make more jam. 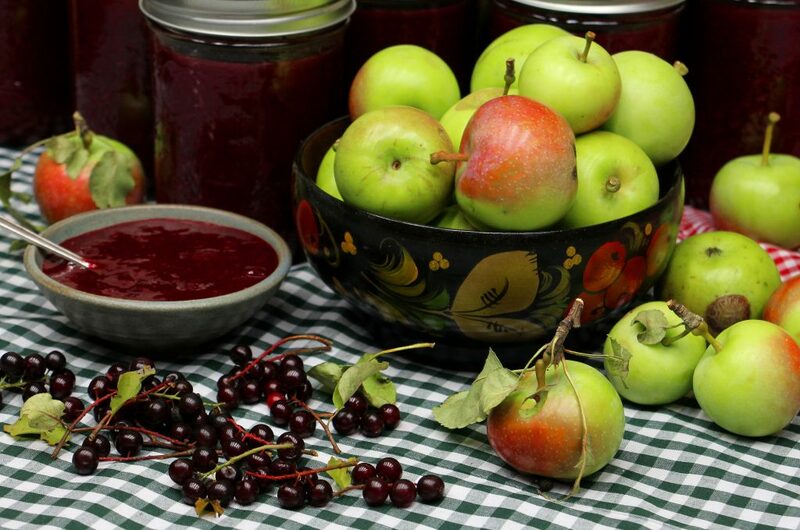 And the more of it, the better, because Chokecherry Apple Jam is the best one for pies and cookies. Rinse chokecherries, drain. Place in a cooking pot, add 2 cups of water and cook on a low heat covered for 30 minutes. Set aside until cooled. Now comes the most time consuming part – to squeeze the juice from the berries. You may prefer to make life easier and to use a juicer. I am hopelessly old fashioned and prefer to do by hand whatever I can do by hand. So, I simply mush the berries with a fork in a sieve, trying to get as much juice as possible, then transfer the leftovers to another sieve, lined with folded in couple layers cheesecloth, tie the four ends of cheesecloth together and squeeze out the remaining drops of juice until the leftover pits and skins become almost dry. I do it in small portions – it is easier, less mess and better result. Put sliced apples into the cooking pot, add 1 kg of sugar and chokecherry juice. Bring to the boiling point, turn off the heat and let it sit on a warm stove for a while. Repeat one more time (if your apples remain too firm, you may need to let the jam boil for few minutes). Before heating the jam the third time, add 2 packs of pectin, dissolved in a bit of lukewarm water (I usually add a few spoons of jam to the pectin/water mixture to prevent clumping). Get your sterilized jars and lids ready. Poor hot jam in the jars, close, let the jars cool and seal. It makes approximately eight 16 oz jars.